Trying to escape from Google Buzz: The Adventure Continues! After I found out what Google Buzz was doing, I turned it off as quickly as possible. As if there weren’t already enough layers in this cake of failure, apparently the link at the bottom of GMail that said “Turn off Buzz” does not actually turn off Buzz – it removes the Buzz cruft from the GMail interface, but it leaves you in the network. Aza is following me? So is Buzz really turned off or not? I’m still not sure what’s going on here. [Edited to add]: Apparently I needed to turn Buzz back on so that I could go in and click “block” on each follower, one by one, until the list was empty, and then turn it off again. Thank you for this post as well. Thanks to it, I now know that I have completely disabled Buzz on my gmail account. This Buzz thing is a mess. We don’t need another social networking site, especially one that doesn’t value its users’ privacy or desires. Google is spreading itself too thin, trying to get involved in everything. They buy up any good idea and somehow funnel it into another branch of the Google world takeover plan. I didn’t realize I was this angry at Google, but I kinda am. They’re starting to get very greedy and selfish. I still don’t know whether I’m on Buzz or not. 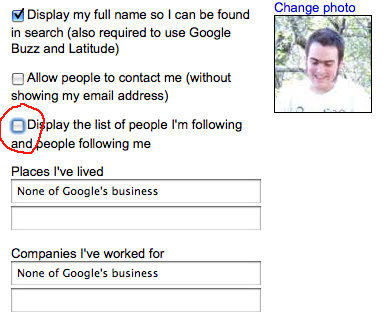 So, I have awarded Google with my vote of non-confidence and removed all what I can from my account, GMail went first. We should be really able to do better on our the servers we have control of or to use some serious partner. Why should we expect any other results when we store our private data with an advertising agency? Um, if you’re not using Buzz, then there’s no reason to block anyone because you’re not posting anything. Buzz is vastly superior to Twitter and I hope Twitter dies a miserable death now that Buzz is around. They screwed up at first, but the privacy controls now are perfectly adequate. Hmmmh… Buzz moves a mail platform into a inaugural social network tool. I always admired Google for their search spirit. But here I disagree with them. My person is in our times a majour concern. Although Google started taking serious the privacy concerns, Buzz although requires to overcome its burden. the people at Google seem to be joking with human data. Google has to do some better reasoning about its consequent activities. You can always email them and personally request they delete your account and data. I had to do that on my itunes account once.